Have you ever heard of a Lenten coin? It is a two-sided ordinary coin with a “heads” side with the flip side being “tails” –nothing unusual about that! However, for the purpose of encouraging you to do something of a self-disciplinary nature for the season of Lent, this image of a coin will hopefully challenge and inspire you to act ! The head-side of this coin encourages you to do something positive, something a bit challenging, and something that would improve your quality of life; the tail-side of this coin encourages you to dispose of something negative, something difficult to release, and something self-sacrificial ! You may choose to do either the “heads” side ( positive ) or the “tails” side ( negative ) of this coin. If you are indecisive, you could simply “flip the coin” relying on fate to determine your choice. A more interesting and beneficial choice would be to act upon both sides of this coin for the season of Lent ( about 40 days ). This is the daunting challenge: could you be determined enough to sustain whatever choice you make for forty days? Before Jesus Christ began His mission of Redemption, He spent forty days and nights in the desert wilderness preparing for His mission and ministry. He was alone, without food, water, and shelter; He emptied Himself to be filled with the Father –praying and fasting. Jesus allowed Himself to be tempted by Satan, who offered “the best” of his world — if Jesus would only give up His mission and worship him. Jesus is calling us, His followers, to do likewise: to spend forty days of prayer and fasting, of self-denial and sacrifice, allowing the Holy Spirit to fill us with strength and courage to denounce Satan, reject sin, overcome temptation, and share in the glory of rising with Christ ! 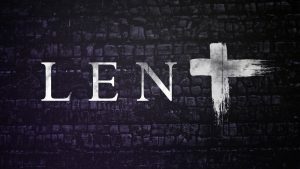 As the season of Lent calls us to prepare for the suffering, death, and resurrection of Jesus at Easter, what are some ways we can participate in this experiential journey ? For one, we could improve our relationships with others ( be they spouse, relative, friend, neighbor, co-worker ). Instead of speaking negatively of their shortcomings, we could replace that destructive habit by speaking well of their attributes; our goal is to “build them up” instead of “tearing them down” ! Think about the reward for them ( and for you ) over the forty days of Lent; these relationships would improve significantly with a “win-win” payoff for everyone ! For another, do random acts of kindness everyday, wherever you go, and to anyone who provides you with the opportunity to act. Imagine your new habit of such “connecting” with others taking hold over the forty days of Lent. Become more generous: carry “extra change” to give away to anyone in need. Even a dollar a day ( over forty days ) would create in you a more generous attitude ! How about reducing an addictive habit, such as committing to “no social media on Sundays!” ( Just wondering… Is there anyone who could do this over forty days? ). Consider sacrificing some television or computer time each day to engage with real people in meaningful conversations –thus building relationships! Displace routine “trivial pursuits” with Bible study, meditation and journaling, reading spiritual books and commentaries. Be the voice, hands, and feet of Christ: become a liturgist, a communion server, an usher; join a church small group, fellowship or ministry; call or visit our church homebound members; give of your time and talent to enlarge the development and growth of our church congregation. Over forty days, you would become more invested in our church life. To encourage any readers who find the “40-day challenge” too stressful, consider this option: Do weekly stretches ( with weekends “off” ), such as designating a “no dessert week”, “no Facebook week”, or pre-determine “lunch-free days” ( pray and fast instead! ), “coffee or cocktail-free days” ( drink juice or water instead! ). Think about selecting one good habit to add ( and one bad habit to eliminate ) for a week, such as adopting an attitude of gracious gratitude and eliminate the self-serving attitude of entitlement –serve others before serving self, and the like. Be sure to keep in contact with God to help you overcome the difficult times; if you fall, forgive yourself and continue with God’s grace to achieve your goal. Post “reminder” notes in places you frequently look at everyday: on your bathroom mirror, computer screen, vehicle steering wheel / dashboard, and other such places to remain focused on your commitment to the Lord Jesus and yourself. Remember that you and Jesus are yoked together in this “work-in-progress” ! 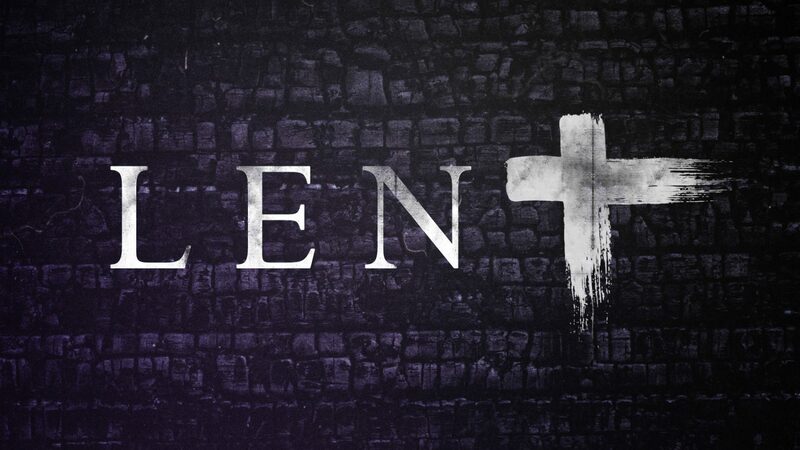 Whatever challenge you decide to pursue, remember WHY and for WHOM you are undertaking this transformation during the season of Lent. You are called to give honor and glory to God, to become more Christ-like in your manner, and more Spirit-led in your attitude. Along the way of this spiritual experiential journey, you may stumble and fall, suffer a bit, be tempted to “give up”, understand self-sacrifice, lean on God for strength to endure to the end. Looking back after Easter Sunday, the blessing is the reward of a “new you” –a new creation– to have followed the way of Christ for forty days! As for the Lenten Coin, I never heard of it either; it is simply a metaphor that arose from my imagination ! How is your new year looking so far? Are you expecting much? We are not victims to our past. We are not destined to merely repeat last year, this year. We can choose a different, more hopeful future. Want to find out how 2018 can be different? Read on, and here’s a hint: Expect more. I wondered though, how many people only experienced what that brochure described should be expected? As if that brochure was the bar to be met. Nothing more or less. We have produced our own Welcome to Cold Spring Church brochure and I am reviewing it with different eyes now. We do want everyone, especially our first-time guests, to feel safe and not be caught off guard or made to feel uncomfortable. That is why I try to help aclimate guests during my Welcome each week as worship begins. But I wonder if our worship is too regimented, regular, and maybe a bit too predictable. It might be better if more surprises were experienced! That is, if worshippers expected MORE from God, and we experienced MORE in worship, wouldn’t we more likely be more energized as God’s creativity and wonder were released?! The story above from the Gospel of Mark about the man who could not see tells what on the surface looks like a failed miracle of Jesus. But it actually tells the story of expectations being exceeded. The man’s friends expected that Jesus would heal the condition of blindness. Imagine like in a post office you line up to see Jesus. Next. Next. And so on. Jesus will heal you. Next, please. As if that was the man’s only need, the man’s vision circumstance, could Jesus possibly care about. But surprisingly, what we learn is that Jesus cared about the man’s entire life experience not just his vision challenges. Jesus took the man out of town, where otherwise-abled people gathered (those we thoughtlessly refer to as the disabled). Jesus wanted the man to experience something other than same old shame and rejection. 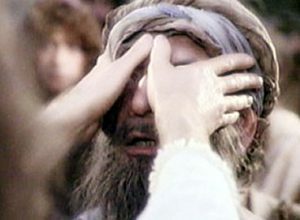 Using his own saliva as a healing balm, Jesus placed his hands on the man’s eyes, asking him if he could see. Yes!, the man exclaimed. The now-sighted man reported that he saw people upside down! Seeing upside down was better than not seeing at all, right? Maybe they should leave well enough alone. They expected that he would see after being with Jesus. Good enough, then! Maybe they should just go back to town with the little they got. But thankfully, they waited, they managed to expect more. They recognized in that moment of increasing clarity that Jesus not only could, but would do much more than they at ﬁrst imagined. At the Master’s Second Touch, all was well, and Jesus reminded him, there is no need to go back to that village begging! Jesus exceeded the expectations, and I believe, he wants to exceed ours, and our community’s expectations, as well. What do we expect in our congregation’s worship and ministry? I suggest, not nearly enough! 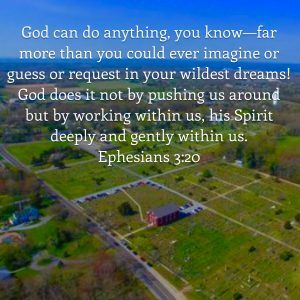 God’s transforming Spirit is urging us to go beyond incremental and incomplete blessings to receive the empowering Second Touch to be that real, new, community of Christ’s disciples. Come on! We have already found we can dream again. We have increased our energy. We have increased our financial giving. We have experienced healing and hope and I don;t think God is out of blessings. Do you? Our 303 year old mission, should we fully embrace it, is to deliver spiritual and other resources through our community of faith to our community at large that transforms our neighbor’s lives in the name of Jesus Christ. What do you expect?! In 2018, our leadership and caring teams, groups, teams, staff, and individuals just like you all have an opportunity to expect more of Christ and of each other. Imagine how our greater Cold Spring area neighbors could experience God is new ways, more relevant and effective ways? How could seniors be energized by hope? How can younger people grow and connect to serve and learn so that more and more people experience the abundant life like that man did, like Jesus continues to offer to us today? During the past year you may be in a better place, but look carefully. You may see, but are “people walking upside down.”? Well, pay attention, because the Master’s Second Touch is on the way for a new, healthy, and abundant year. Get involved a bit more. Give a bit more. Engage a bit more. Serve a bit more. 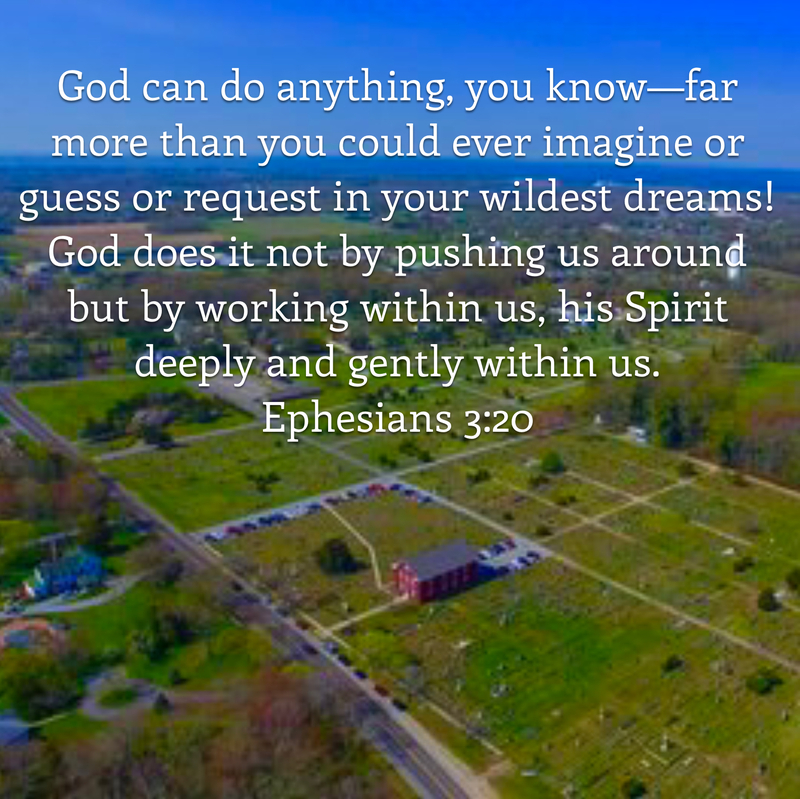 Cold Spring Church: Energizing Spirits. Transforming Lives. Expecting More. Caller identifies themselves as a representative of Atlantic City Electric. Caller tells the victim that they are behind on their bill and payment is needed within 24 hours or their power will be shut off. The victim is instructed to go to Rite Aid or CVS and purchase a “Money Pak” and is provided a return number to call back. Once the Money Pak is purchased, the victim is asked to call back and read the number off the Money Pak and the scam is completed. It is very important to know that on some of these calls the in-coming number on the caller ID is showing up as Atlantic City Electric. The Electric Company does not request payment in this way. The perpetrators are preying on the victim’s fear that their utility service will be shut off during the recent inclement weather. Before you send any money over the phone, you should always call the appropriate number listed for your utility company or contact the police to report the suspicious incident. If you have been a victim of this type of scam or have information about the incident please contact your local police department.